People’s motivations for seeking body modification reversal are as varied as their reasons for modifying their bodies in the first place. Experts discuss the reasoning behind gauged ears and the proper way to fix them. People have been modifying their ears for millennia. Tribes in nations across America, Africa, Eurasia, and beyond have engaged in ritual ear stretching for any number of religious, cultural and traditional purposes. But the practice has never been limited to tribesmen. Over the centuries, everyone from King Tut to the world’s oldest mummy — Ötzi the Iceman — has done it, to say nothing of American Idol alum Adam Lambert. In ancient times, everything from stone, horns and bone to teeth, claws and shells were used to stretch the ears. More recently, methods such as tapering, “dead stretching,” Teflon tape stretching and even weights have been used to enlarge piercings. And while gauged ears may be the most common of modern extreme modifications, many other such practices have caught on. These include lip gauges, dermal implants, tattoos, extreme breast and buttocks implants, as well as extreme lip injections. Has the trend gotten out of hand? Many people think so, and we’re not just talking about disapproving moms or the U.S. Army (which considers ear gauging to be a form of bodily mutilation). Earlobe repair and other extreme body modification reversal procedures are growing increasingly popular among former body-mod enthusiasts. The ancient practice of ear stretching applies to both women and men. It was and still is a sign of one’s standing in the hierarchy of males in certain tribes; the larger the opening, the more prominence. Among women, the practice of ear stretching has traditionally been more for ornamental purposes or to show that a girl has arrived at womanhood. Ear stretching is practiced for these purposes by many tribes and cultures to this day. Most recently, however, some people have chosen to stretch their ear piercings and/or seek other body modifications for a variety of more modern reasons — not all of them healthy. In her 2003 book, In the Flesh: the Cultural Politics of Body Modification, sociologist Victoria Pitts-Taylor, a professor at the Graduate Center of the City University of New York, notes that ear stretching gained popularity in a similar manner to other rituals stemming from the subculture, including standard piercing and tattooing. Incidentally, tattoo removal procedures are also gaining in popularity, despite the high cost of laser tattoo removal and other new techniques. According to Pitts-Taylor, the practice’s growing popularity in modern times can be traced back to the 1980s and ‘90s, with the emergence of the body art movement. At that time, so-called “modern primitives” appropriated rituals from around the world for a variety of reasons, but primarily to express solidarity with more “primitive” cultures or to stand out in the crowd. A couple of decades ago this quest to be cool via ear gauges was sometimes associated with the hippie, punk or rock scenes. But over the past 15 years or so, ear stretching has all but entered the mainstream, with people from all walks of life being drawn to the practice due to fashion, media and celebrity-related influences. As a result, the die-hard body modifiers have ratcheted things up a notch, according to Pitts-Taylor, perhaps as a show of greater dedication to the practice. Among the ear stretching crowd there’s even a name for a member of this hard-core crew: “gauge king” (or queen). While one might be tempted to believe that all of this is about fitting into a clique — and sometimes it is — in some cases the truth is a bit darker. “Most patients express that they wanted to differentiate themselves in an extreme fashion, typically in a time of personal growth,” says Dr. Andrew Tussler, MD, an Austin-based board-certified (ABPS) plastic surgeon with specialty training in cosmetic surgery. “But other times,” he points out, “a person’s motivations for differentiating themselves stem from a difficult time of self-harm. So some of these body modifications could be a form of self-harm and self-mutilation.” Tussler also notes, however, that most people eventually manage to move through this phase. To understand why people ultimately decide to have earlobe gauges removed, it’s important to understand the practice itself. Earlobe stretching works by inserting a plug, or “gauge”, into the earlobe. Over time, bigger gauges are inserted one at a time to continue stretching the earlobe. People with gauges who choose to undergo earlobe repair surgery are looking to reverse course and restore their ears to their original shape. However, as a result of having stretched their earlobes so dramatically, the skin cannot retract to its former shape without help from a surgeon. Otherwise, upon removing the gauge, the skin immediately hangs. This is because it has been stretched to such an extent that it’s lost its former elasticity. It goes without saying that this is an unwelcome turn of events for anyone who has decided they want to cease wearing gauges. As a result, many people are now turning to plastic surgeons to address the problem, because in order to repair the ear, surgery is needed to close the opening and excise any extra tissue around the lobe. According to Dunkley, most people seeking these procedures are doing so because they’re changing careers (e.g., applying to law school, medical school, business school) and feel the gauged ear look will reflect poorly on them. Among them is our aforementioned former construction worker, who also told Dr. Dunkley that once he decided to apply to dental school, his ear gauges were a detriment to him as an applicant. Austin’s Dr. Tussler concurs that potential employment is one of the most common reasons people decide to undergo body modification reversal procedures. 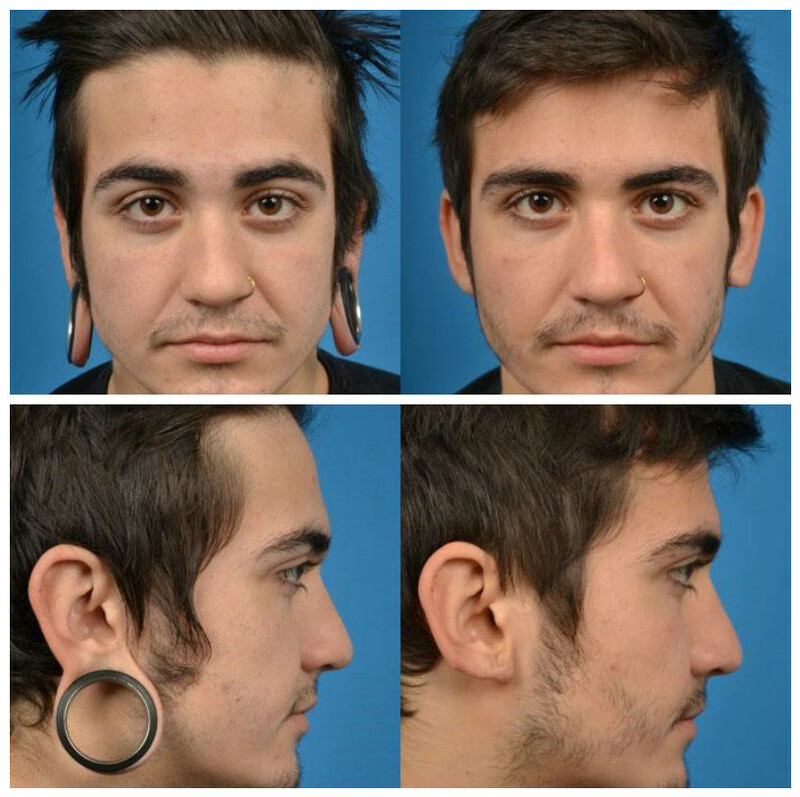 Other frequent motivations he cites include relationships and malfunction of the piercings and/or gauges. Surgeons may use slightly different techniques to repair the earlobe but, generally speaking, the procedure is considered to be relatively straightforward and safe. Tussler performs the procedure in his office with local anesthesia. First, the area of piercing or gauge is removed in a wedge fashion, the back skin is closed, the middle tissue is repositioned (to provide strength), the margin of the earlobe is lined up and the skin closed in a straight line. If the earlobe is stretched, as with patients that have used gauges, the excess thin skin and earlobe are removed and a new smaller earlobe is created with closure of an upper wedge or flaps. As with any surgical procedure, there are some risks associated with earlobe repair, but most are minor. “These include new scars, asymmetric earlobes and deformation of the tissue around the old piercing, as well as difficulty piercing the new area,” says Tussler. “There are risks of infection when closing some piercings if all of the skin within the pierced hole has not been removed. Recovery is short, with the stitches being left in place for five days, scar care commencing in three weeks and potential for a new ear piercing as early as three weeks postoperatively. For those considering earlobe repair or any other body modification reversal procedure, it’s always best to try and find a doctor who has a vast amount of experience with these particular surgeries, both to better avoid any potential complications and decrease the risk of having to undergo a revision procedure.